Crocodiles were busy last month in New York before having to call off the rest of their dates due to a family health emergency. The Dum Dum Girls also canceled and my thoughts are with Kristin and Brandon. While in NYC, Crocodiles recorded an Insound Session. 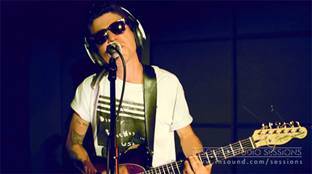 Crocodiles came in to record a session while they were in town for a couple of shows this month. The band laid into three new tracks from their latest album Sleep Forever and one classic cut from Summer of Hate and all four songs came out absolutely fantastic. Get a link to download the other three tracks from the session free with the purchase of Sleep Forever. I was trying to embed the video, but the code isn't working. You can check it all out here, including the free download of "Mirrors".